Slushie Machine | JOLLY JACKS JUMPING CASTLES! 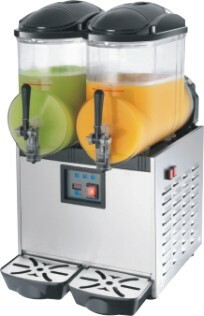 Slushie Machines are great for both kids or adult parties. You’re guaranteed to entertain your guests when you hire a slushie machine . Price includes delivery to your location, please let us know if you don’t have a sturdy location to put the slushie machine onto and a table will be provided. Please note: Plastic trestle table will not hold slushie. Everyone will love the amazing drinks that you will provide out of this machine. You can make them with or without alcohol, so no matter if you are having a kids or adult party, you can serve these refreshing drinks. Included is 2 by 10ltr mix of your choice (list below), 100 cups and 100 straws. Tip: If the mixture stops turning in the blender, stop the blender and stir the mixture around a few times with a spoon or spatula, continue blending.